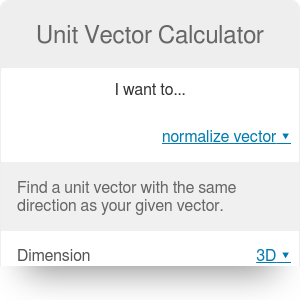 This unit vector calculator will help you transform any vector into a vector of length 1 without changing its direction. If you want to know how to calculate a unit vector's components, look no further! You can obtain the result by dividing the components of any arbitrary vector by its magnitude. Don't worry if you don't know how to find a vector's magnitude, though. This article will give you a step-by-step explanation. A unit vector is a vector of length equal to 1. Every vector in a 3D space is equal to a sum of unit vectors. |u| is the magnitude of the vector u. Calculating the magnitude of a vector is also a useful skill for finding the midpoint of a segment. Write down the x, y and z components of the vector. In this case, x₁ = 8, y₁ = -3 and z₁ = 5. Now that you know the magnitude of the vector u, you probably want to know how to calculate the unit vector. All you have to do is divide each of the initial vector's components by |u|. Now, write these results in a vector form to find the vector û = (0.8081, -0.3031, 0.5051). You can check whether the result is correct. If it is, the magnitude of your unit vector should be equal to 1. Unit Vector Calculator can be embedded on your website to enrich the content you wrote and make it easier for your visitors to understand your message.